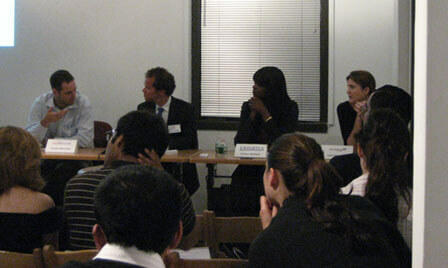 Last night, we hosted our first Admissions Consultant Panel Discussion at our center in New York City! We invited our friends from Clear Admit, MBA Mission, Expartus, and Stacy Blackman Consulting to engage in four separate conversations with our Director of Instructor Development, Chris Ryan, who roleplayed as four prospective students applying to business school. Afterwards, the attendees and consultants engaged in a question and answer session. The event exceeded even our own expectations. The energy level was astounding, the consultants’ reactions to the case studies were extremely insightful, students networked, and many even stayed long after the end of the event to ask more detailed questions to the consultants. A special thanks definitely goes out to all of the consultants, who stayed until they answered every student question. For those of you who couldn’t make the event, we’ll be posting audio from the discussion in the next week, so check back if you want to receive free advice from the best consulting agencies out there! Most folks regard Reading Comprehension on the GMAT as fairly predictable and boring, particularly in terms of the format. Generally students see 4 passages, 3 short and 1 long, with 3 questions for each short passage and 4 questions for the long passage, for a total of 13 questions. However, there have been reports of some funny business on the format of Reading Comprehension recently. One student reported having seen 5 passages, which would be unprecedented in our experience (though one of them was doubtless experimental). Also, another student reported a short passage that consisted of only one paragraph, which would also be something new. The moral of the story is, do NOT take for granted the number of passages and the number of Reading Comprehension passages anymore, as there seem to be some tinkering and experimentation going on with the format. More info to come if/as we get consistent confirmation of format changes. ManhattanGMAT, shortly after opening a center in our nation’s current capital, is proud to announce the opening of another location in our nation’s original capital. Worry no longer, denizens of Philadelphia, for ManhattanGMAT has scheduled a preview class on August 21st at 6:30pm and a 9-session course (with accompanying trial session) set to begin the following week, August 28th also at 6:30pm. We are also pleased to announce that the preview class and the 9-session course will be taught by ManhattanGMAT’s first hire and current CEO, Andrew Yang. To register for any of the sessions, simply follow any of the links above.